This morning a small, grey package of love left this world for the next. At the age of seventeen years, Snoopy the cat passed away in her home with the same quiet dignity that she lived her life. She is survived by her son, Ben, her surrogate daughter, Katie, and a small but fiercely loving family of humans and cats. I am looking back on the years that Snoopy`s life and mine intertwined. She came to live with us when she was only a kitten, arriving at the door in a box with my son, Sean. He was in Grade One and one of the the teachers was finding homes for a litter of kittens with the students at his school. So, with our permission, Snoopy was brought home. I am not sure why he gave her a dog's name but in the way of all young cats she lived up to it, getting into everything, unravelling and shredding countless rolls of toilet paper. Snoopy came to a home with one cat already in residence. I had been sent to the Humane Society a few months before to bring home a kitten. They should have known better. Instead I brought home a seventeen year old Tabby point Siamese, a beautiful neutered male who had been surrendered by his sole owner for reasons I never knew. He was, of course, named Tabby. He had to come home with me because his card had been pulled from the door of his cage and he would be making the trip "down the hall" later that day. Tabby was severely depressed by whatever circumstances had separated him from his previous owner and we worried for his survival the first few weeks. And, although he regained his health, I have to say that all he was doing was surviving until Snoopy entered his life. It became quickly became obvious that Snoopy was not to be our cat, but his, for the remainder of his life. Tabby interacted with us and Snoopy interacted with him. In the way of all young female cats, Snoopy quickly became interested in getting outside. We managed to get her through her first heat without her escaping but during her second heat she snuck out and returned with a look of satisfaction and several buns in the oven. Timing is everything and Snoopy went into labour on the day we were making our big move from the city to life in the country. As the furniture and boxes were going out the door, Snoopy was giving birth to four kittens with Tabby acting as midwife. I have such a clear memory of her stretched out with her front legs extended in front of her, Tabby stretched out in front of her with his front paws resting softly on hers in comfort. He was her labour coach. Snoopy`s two sons, Ben and Kabitz, lived with their mother permanently. Ben passed away earlier this year - an independant soul who was always at the top of the pecking order in a house that eventually grew to encompass five cats. Kabitz has been a momma`s boy all his life and I wonder how he will continue on without her. He is an old man himself now. Tabby blessed us with the last two years of his life. It was a major adjustment for Snoopy when he died but she had her sons now. She dedicated herself to her two boys and to my two children, seeing them all safely through their teenage years, providing warmth, comfort, understanding, mice, and either a quick, fierce grooming or a cuff on the ear as required. She had a private moment with my husband, Gary, each morning as he sat with his first coffee - the only one he can abide communicating with that early in the day. Snoopy has always held a special place in his heart and his lap. In her last years, Snoopy became blind and although she maintained her dignity. she came to depend on us all more, with an increasing need for contact and affection, a desire we were happy to fill. As her own children had grown, Snoopy dedicated herself more and more to the raising of my daughter, Katie, and was honoured to have Katie refer to her as `My Mother`. Snoopy was a small cat, barely five pounds, with the marking of a tabby and beautiful concentric circled markings on each side. She had a neverending love for pipecleaners. She was loved. She will be mourned. She left taking a part of me with her. An EQ internet group I belong to had a Christmas in July swap and these are the wonderful goodies I received in the mail from my secret sister. There are some wonderful things I can use in my crazy quilting: two doilies, two crochet flowers, a lovely pink metallic thread, some rattail, ribbons, lace, pearl cotton, lots of beads and sequins, and some very pretty white flowers for embellishing! There are also some great "sane" quilting goodies. 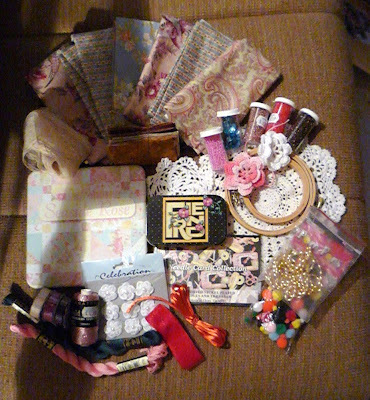 That pink tin is full of squares of Moda fabric all coordinating and with instructions on making a mini-quilt with them. The fat quarters also coordinate with the fabric in the tin. That cute little tin that says "Friend" on it is full of safety pins. There is a darling package of needles, some embroidery hoops and even a angel shaped soap. The soap is not in the picture. What can I say? Camping is dirty work and a girl needs to pamper herself - lol! I will have lots of fun with all these goodies. Thank you, Secret Sis! Well, this has absolutely nothing to do with stitching. I played a bit more with the new camera last night, trying out the fireworks setting. Someone was setting off some fireworks at the campsite so it seemed too good an opportunity to miss! I'm quite pleased with how it worked. Hopefully I'll have more chances to try this again. 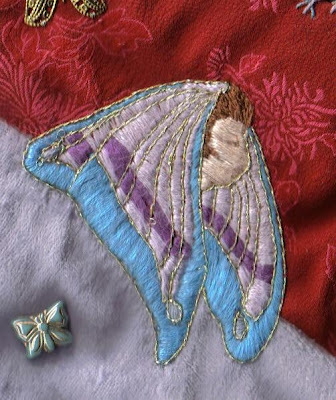 Carole is loved and admired by the crazy quilt community and her blog is well worth checking out! This is the first picture I have taken with my new digital camera my darling husband gave me for my birthday. This shot is nothing fancy, just figuring out the on/off switch, etc. lol I can already see a big improvement over my old camera though, which had become very unreliable. So, I'll be experimenting now to find all the bells and whistles this little beauty has. 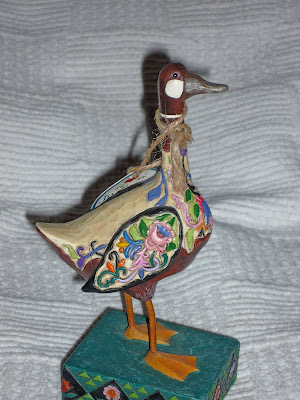 The picture itself is of a little statue my darling daughter gave me for my birthday. Isn't it adorable? It is a Canada Goose, of course, which is appropriate in itself and decked out with quilt designs which I adore. The best part though is that the name of this piece is "Lady of the Lake". Now, if you know me, you know that I spend five months out of the year working out at a provincial campground as a campground host, living and working beside Lake McGregor. So, is this name perfect or what? And, best thing is, she had no idea of the name when she picked it out. So it all seems like good karma or something! I found a great resource today! 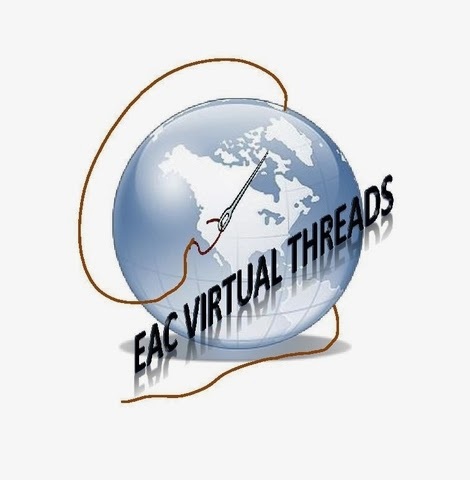 Needle 'N Thread.com has an extensive library of video tutorials on hand embroidery stitches free for the viewing. I watched the one on buttonhole wheels and it was very well done - clear and good instruction. I think these videos would be very useful for experienced stitchers as well as beginners. Anyway, this is the block I made today for the On the Seamy Side Round Robin at CQI. It is a bit big and has a few less than seams than I hoped for but I am sure it will be okay. Since I have been working on BC blocks I had lots of cream and white scraps and thought it would be fun to do a cream on cream coloured project. This is going to be one side of a tea cozy when it is done. While it is making its rounds I will be working on the other side of the tea cozy and then be able to sew them together after the round robin. This round robin is a sampler one - each month we will be working on a different stitch. Also, it is mainly seams and not many motifs so I think it will be really pretty. Can't wait to see it as it makes its rounds. It is always a bit of a puzzle to me what to do with all the round robin blocks after the round robin is over. With this one the decision was made ahead of time and the block was made up originally for the size of needlebook I wanted and then just sewn up when it came back. I found these pictures while going through some older stuff and wanted to share it. Everyone did such lovely stitching on it and I love the colours! This was my first attempt at working with orange and I feel in love with it! Janet has posted pictures on her blog http://gocrazywithme.blogspot.com/ of her completed cq colour wheel. It is amazing! I think this is the first time the use of complimentary colours has made sense to me. In each wedge there are touchs of the colour from the opposite side of the colour wheel and it works so well. 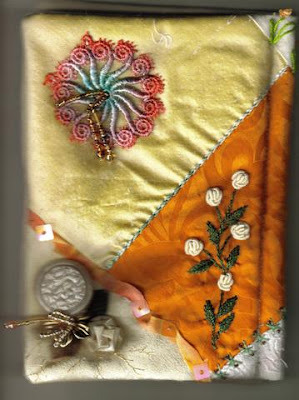 Besides the magnificent use of colour this piece is what I consider the very best of crazy quilting: exquisite seamwork and the use of embellishments is balanced and not overpowering. I love it! You can also check out Lauri's Colour Study quilt on her blog http://dontcallmecrafty.blogspot.com/ . It is beautiful also! Set up in a similar theme but in a different format - very effective! Gorgeous stitching! 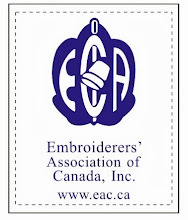 It was exciting to see Kim, a fellow member of CQI, take first prize in the quilting division. Congratulations Kim! It is wonderful to see a crazy quilted piece win in a general quilting category - makes the win especially sweet! Kristen at Retro Art Cafe http://krishubick.blogspot.com/2008/06/art-giveaway-and-thank-you.html is giving away a gorgeous work of art. 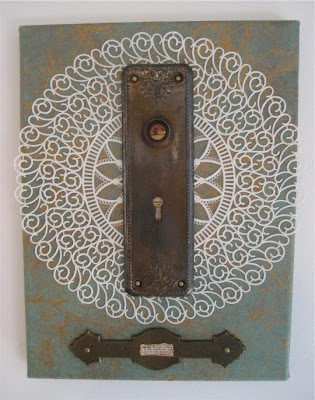 Check out the site to see the beautiful details in this piece! This is a motif I did awhile back. I just came across it and thought I would share. I guess it is an example of inspiration coming from anywhere. This motif was inspired by a picture I saw of a plate with a similar design. I loved the butterfly lady and wanted to recreate something similar. I stitched her for a fantasy themed round robin. Having come across her again I would like to try doing something similar again. My block arrived home this week in the CQI Novice Group Anything Goes Round Robin - look at all the stitching these ladies did! Many thanks to Rosa, Rebecca, Rita and Sharon as well as the special Round Robin Angel is this go round - Leslie! 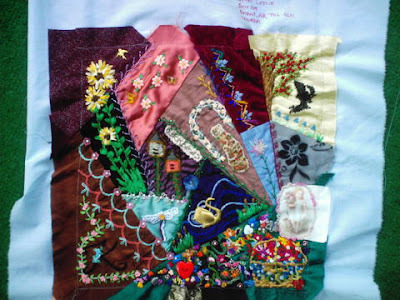 The block came home pretty well encrusted with all kinds of stitching - there is so much to admire and study on it. My two comfort dolls arrived safe and sound at Pat Winter`s and she has posted pictures. The pictures she took are so much better than mine that I have taken the liberty of adding them to my original posts. Hope this is okay Pat! I'm still playing around with these fimo faces I made. So, here is another cabachon. This is one of the larger faces I made, about an inch and a half across. 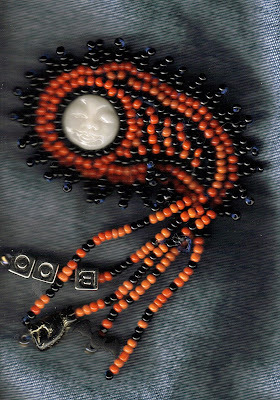 I beaded around it several times and then did the edging. These are larger beads than the other one as well. It is for my friend, Shari, and I will be putting it in the mail to her soon. I didn't put a pin on the back of this one because I don't know what she may want to use it for? Maybe as a pin, or on a purse or doll or, considering its size, as a doorstop. lol Anyway, it was fun to make and good practice! I was looking through some old pictures today and came across these. I was in a DYB (Do Your Block) Round Robin at CQI with a Christmas theme a couple years ago and these are what I did for Jill. Since she wanted to make Christmas ornaments from them, each of her 6 inch blocks was split down the middle, making two smaller blocks to be worked separately. And, because it was Jill, the blocks were pink of course! lol I think perhaps she is converting me to pink because I quite like these. I think it is a great ornament idea too to do with a DYB round robin. Might have to try this for myself! Well, here I am playing with these fimo faces again. This one is a little moon face. I wanted to make a cabachon pin and I wanted to use a paisley shape so this was the result. 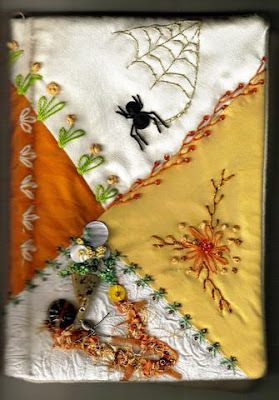 It is a little Hallowe'en brooch and I will be sending to my friend, Dee. The beads I used were from a multi-strand necklace I picked up at the thrift store - couldn't resist these Hallowe'en colours! I hope she will enjoy it.